There are ways to load CCcam.cfg card sharing account for Dreambox using FTP and CCcam.cfg Editor, which is suitable for beginner. If you wonder how you can perform the same on OpenBox, or Skybox S9, a HD (High Definition) capable satellite decoder that have been widely dubbed as a replacement for a more relatively expensive DreamBox 800HD, here are some pretty simple steps that you can get it done. From the remote control, go to Menu -> Network Local Setting -> CCcam Plug Setting. 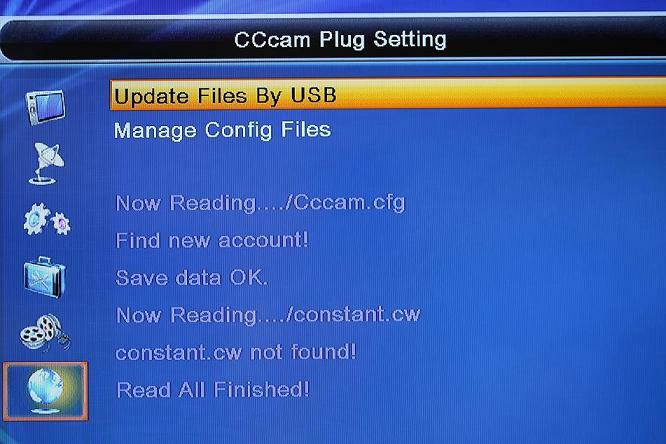 Under CCcam Plug Setting, choose ‘Update Files By USB’. When prompted for Add Update Files, choose CCcam.cfg (CCcam Plug) followed by Read (Yellow button) press. Then, go to Manage Config Files -> Highlight CCcam.cfg and press OK.
By now you should see the cline server, click Active (Green button) to activate it so that they are online connected to card sharing server. Hopefully this is simple enough and can be done even by newbies that has no such experience before.